Don’t you just LOVE November? That crisp, fall air? Those beautiful colored leaves? And of course the smells of all those yummy Holiday Recipes? 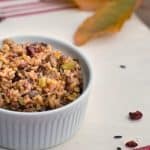 Like this Holiday Instant Pot Wild Rice. Ok, Wild Rice isn’t really RICE at all….I knew that...did you? it’s more like grass seed. Honest! But it’s a super HEALTHY grass seed… that all of us should be eating more of. Yeah, it’s all that and more. Well, I took this super yummy, super healthy, slightly nutty, superfood ….and turned it into a new Holiday Favorite by mixing it with Mushrooms, Sage, and Cranberries, and cooking it in my Instant Pot Pressure Cooker. That’s what I did with it. And I can guarantee it will definitely have a place on MY Holiday Table this year. So you ready to start cooking? Let’s go. Start by dicing about ½ of a large Onion (1 cup) and 3-4 Ribs of Celery (1 cup) and lastly 6 medium-sized Criminy Mushrooms (8oz). Toss the veggies into the Instant Pot and saute in a little water or broth until softened. Now stir in some minced garlic (about 2 big cloves) and the seasonings… (Sage, Rosemary, Thyme, and Pepper). Continue to saute just until the garlic and spices get fragrant – then turn your IP off. Stir in 2 Tbs of Soy Sauce and 2 cups of Low Sodium Vegetable Broth. And finally, stir in 2 cups of Wild Rice that has been rinsed and drained. Make sure everything is mixed together and attach the lid. Make sure the vent valve is set to SEALING and press MANUAL. We want to set it to HP mode (high pressure) and 25 MINUTES. That’s it….walk away for a while. When the IP beeps, let it naturally vent for 10 minutes or so before carefully releasing any remaining pressure. Now personally I…… like to add dried Cranberries and chopped Walnuts to my Wild Rice…..along with a few tablespoons of Balsamic. The Walnuts give it a little texture, the Cranberries a little sweetness, and the Balsamic adds a little twang. But this is me. If you can’t have Walnuts….leave them out. Don’t like dried fruit? Leave it out. Need more salt? Add it. At this point, the rice is done and you can finish it off any way you like. Just fluff with a fork and you’re done. Perfect….. ready to serve on YOUR table this Holiday Season. As always – l hope you like this recipe as much as I do, and be sure and look for many more Holiday Recipes this year from BNV. 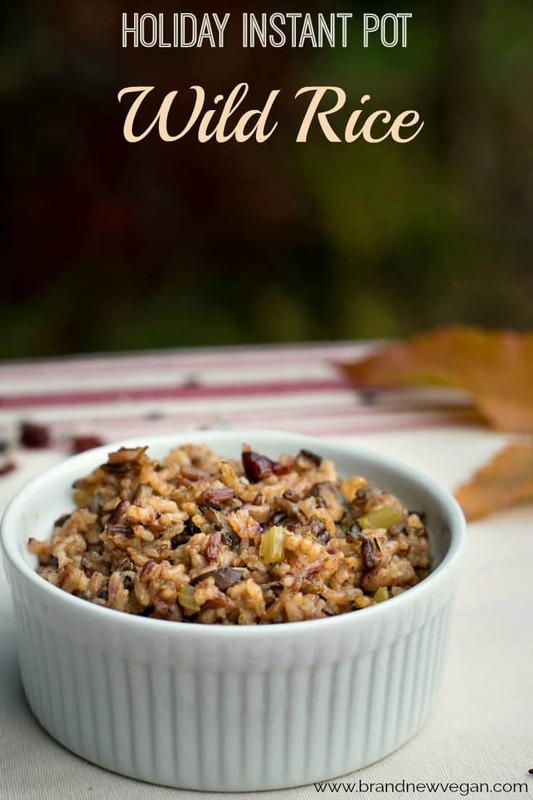 This Instant Pot Wild Rice is my first Holiday Recipe of the year. 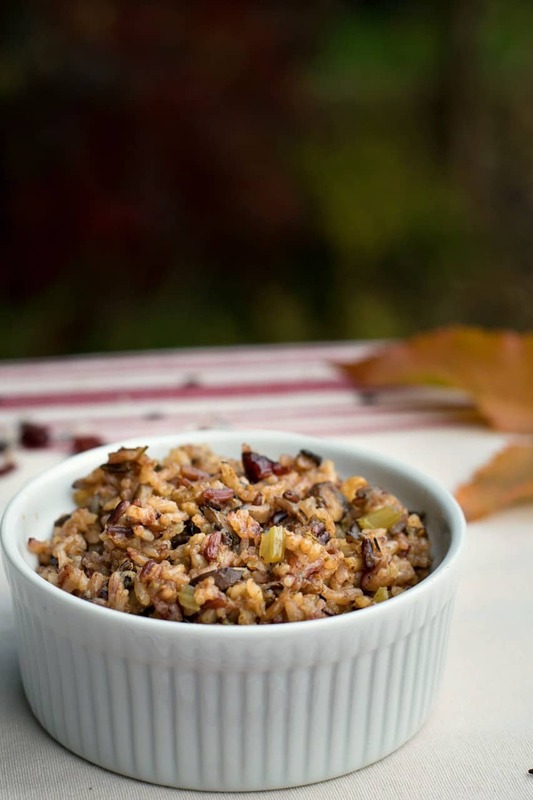 Wild Rice, Mushrooms, Sage, and Cranberries make this perfect for any Holiday table. Dice onion, celery, and mushrooms. Add to instant pot. Saute veggies on LOW using 1-2 Tbs water/broth until softened. Add vegetable broth, soy sauce, and rinsed wild rice. Stir to combine. Attach lid, set vent valve to SEALING, and cook on MANUAL, HP for 25 minutes. Allow to naturally vent for at least 10 minutes. Then release any remaining pressure and remove lid. Stir in cranberries, walnuts, and balsamic. Fluff with a fork and serve. I hope you post how you made out with the Rice Cooker idea…. And post times adjustments you made for I to work, if it does… I used to use a regular pressure cooker, but was always scared of it… so got rid of it. I’m hoping Santa brings me a Instant Pot for Xmas…lol. They are a way safer, I’ve read in reviews and talked to friends that use them. How much did Instant Pot pay for this recipe to be posted? Absolutely nothing…..if they did (as in it was a sponsored post), then I would have disclosed that information immediately. I made this recipe the other day; testing for Thanksgiving recipes. It tasted great; and because of the Instant Pot, so fast and easy. This will be our third Thanksgiving on the WFPB lifestyle. At age 79 I’m enjoying finding new recipes for which to give thanks. Thanks, Chuck. We made this today, and it worked perfectly. I do not have either an Instapot or a rice cooker, so ours was cooked on top of the stove. I used our biggest Scanpan skillet to saute the veggies and just put the broth and the rice in with the veggies. I used more broth: four cups of broth to the two cups of rice. I brought it to a boil, put the lid on and lowered the heat to a low-to-medium-low temperature and cooked it, covered, for forty-five minutes. Then I took it off the heat and let it cool for ten minutes before uncovering it and stirring it with a fork to fluff it. The only things I did differently was to use fresh rosemary rather than dried because we had the fresh growing and I was out of the dried, and I also lightly toasted the walnuts. Thanks for the recipe. Thank you for the stove top adjustments! Could this be served at room temperature. I’m going to a potluck and this recipe sounds perfect….except that there will be no way to keep food hot or cold. I think it would be ok for a little while. Maybe keep it refrigerated as long as you can before letting it sit out at room temp for awhile. Chuck, this is a great recipe. My challenge is entertaining a bunch of carnivores at the holidays and still having good food for me. I tested this recipe to use for Christmas and I love it! So creamy and delicious, even my carnivore husband liked it. I will be serving it to all my relatives and I won’t be saying it is vegan or is good for them. They are going to gobble it up. Thanks for th recipe! Follow up to my original comment; I made this for the extended carnivore family at Christmas and they wolfed it down. They loved it, begged for the recipe and one even bought an InstaPot to make it. I made some minor changes, doubled the mushrooms and added the cranberries but not walnuts. So good! This recipe is AMAZING!! I have been making it every week for since you posted it. This was the first recipe I made in the instant pot I received as a wedding gift. Super easy & flavorful! I find myself mixing the leftovers with hummus. Mind blowing! I also made this for two “meat lovers” christmas gatherings & many people left with the recipe to make themselves. Don’t know exactly what to use for the Wild Rice Blend. What do you recommend? I made this today and wondered if the texture was supposed to be sticky. It seemed too moist or mushy. Should I have cooked down the mushrooms more before adding the rice and broth? I made this for dinner last night. So good and easy to fix. This will be our new addition to our holiday, and anytime of the year, meal. Thanks again. 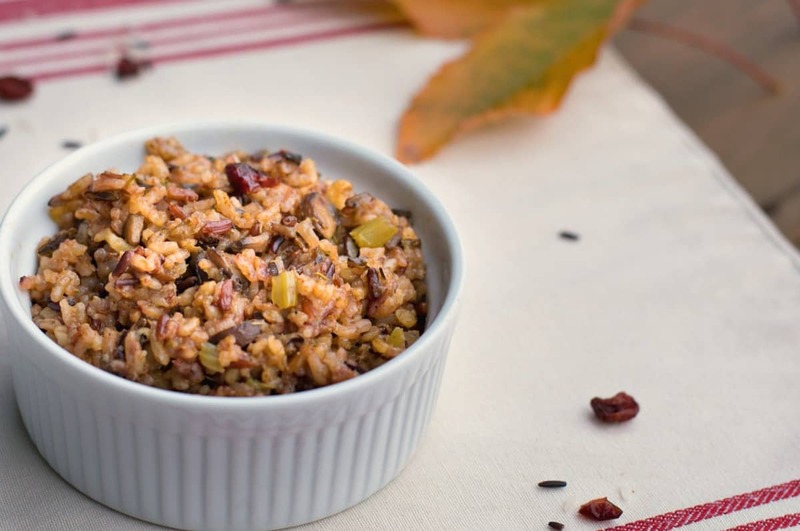 Which brand of wild rice did you use? I’m not a big fan of wild rice but yours looks like it has a lot of brown rice mixed in. I’ll be making this for our Easter lunch buffet. I thought the picture looked like it had brown rice in it too, but maybe it’s just the mushrooms. How did your brunch turn out. Was the dish well loved? I have made this recipe twice and wonderful both times! Once for Christmas and now once for Easter! Very yummy and easy! Thanks! I served it with baked squash, mashed potatoes and mushroom gravy! Hi Chuck! This is probably a silly question but could I use plain old brown rice for this? I have a ton of it so would prefer to use that if I could. Thank you for all you do! Probably – don’t see why not. I made this for supper tonight, and we all had second or third helpings! I used a 6.5 oz can of mushrooms, which drained was 4 oz, and chopped it very fine because I am not a mushroom fan. The finished rice had the umami flavor without chunks large enough to bother me. That amount was plenty! I tasted it with some walnuts and some without, and it was just as delicious without. Also, since I live above 5,000 ft., I cooked the wild rice for 29 mins. in the IP. Next time I’ll do 30.
the ingredients list calls for wild rice blend. is that what you used or did you use pure wild rice? the blend has more brown than wild, doesn’t it? I just bought fresh cranberries and was curious if they could be used instead. Any advice would be great – thx! I have not TRIED fresh cranberries …but I would try it! Why not? I cut them into really small pieces and added them in per the instructions. I let them sit for about 10 minutes in the leftover steam. I really enjoyed it! Great recipe – thx for sharing! PLEASE report back on how the fresh cranberries worked. I was going to ask the same question! This is truly delicious! I used half wild rice and half brown rice, and it was great. It makes a lot, so it’s important that it reheats well, and is even good cold. I will be making this together with a roasted squash dish to take to the family thanksgiving. Main dish for me, yummy side for everyone else. Love the recipe and have made it several times. This time there were only two of us for Thanksgiving and I have more than enough left-overs. I’m wondering if I can freeze some of it. Has anyone else tried this? There were only two of us for Thanksgiving and I have more than enough left-overs. I’m wondering if I can freeze some of it. Has anyone else tried this? My daughter made this for Thanksgiving. It was so good. A real keeper. I’m making it tonight so that I will have lots of good leftovers. I loved this recipe! Reminded me of stuffing, but better! I used pecans instead of walnuts and paired with acorn squash. Thank you! We loved this rice! I served with acorn squash. My 4 year old devoured it! So tasty!